The small card case holds five credit cards. Horse leather (shell cordovan), vegetable-tanned. Divided main compartment, each with two slots. Width 10.4 cm, height 8 cm. Weight 25 g.
Care instructions: The horse leather has a high wax content as a result of the production process. Additional oiling makes the leather dull. If necessary, simply polish with a woollen cloth. Lasts a Lifetime. Shell Cordovan Cases. Shell cordovan horse leather enjoys an excellent reputation – and rightly so. The indestructible leather not only has a characteristically soft surface, it is also valued for its toughness even after years of use. 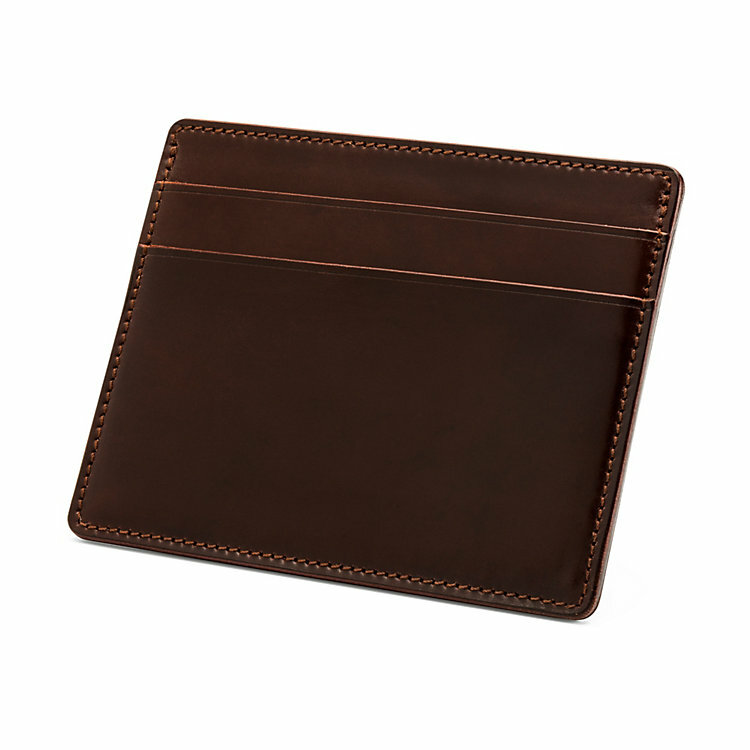 The shell cordovan leather is tanned by Horween® in Chicago. Leather manufacturer Kreis then makes wallets and these two card cases out of the leather for our collection. Like the wallets, the card cases are made with minimal seams. The parts of the case that are exposed to particular wear and tear have no seams at all. They are also made without lining because unlike other leather qualities shells have two attractive smooth sides. The flesh side of the leather is used for the external side of shell cordovan products, the hair side is used for the interior. Because the leather is neither dyed nor finished, the inside of the products bears no official manufacturers' stamps as proof of origin. Finally, the leather edges are buffed, stained and polished with hard wax and finished with a groove detail. With a little care, the cases can last a lifetime.